There isn't much info online about The Event. They were a late 80s mod garage rock outfit from San Diego. I saw them play a few times, at least once at a New Sounds of the Sixties gig. I remember that they had a tendency to smash to bits old TVs and radios as part of their act, which I thought was pretty cool at the time. No matter, the sound was pure sixties garage psychadelia and R&B. 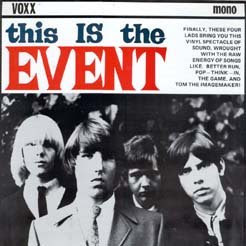 The Event only ever had the one release, cleverly titled This Is The Event. The track here is from that record, "Pop Think In" and was my favorite.